The Ventricle is a Klien recycler. 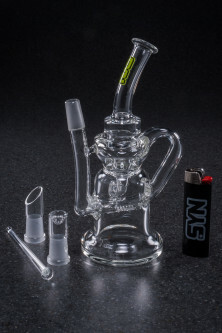 This bubbler utilizes an extended circular pathway of water to increase percolation 10 fold. Instead of counting individual percs and estimating diffusion based on length of stacking bubbles, the entire interior of this tube is a percolation machine. The bubbles start out of a fixed inline, and quickly move into the external tube that pull water up and extended diffusion arm, and then empties into a whirlpool chamber that drains the water back into the reservoir. Simply has to be seen to be believed. This design is smaller than the full-sized ventricle, so we called it mini ventricle. We put all our clever into the tube.